According to a post on Mayor Dave Kaplan’s Facebook page, the Des Moines Theater – located at 22325 Marine View Drive – has been sold. According to a deed search with King County, the new owner is Daniel D. Spalding, a Musician/Artist/Developer from Spokane. 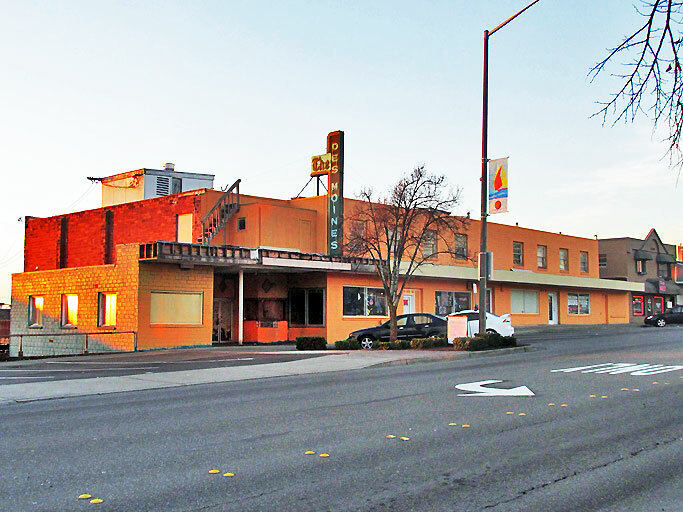 The building sold for $430,000, and includes 10,572 square feet of space. “The theater was opened as the Des Moines Cinema in March 1947 by Delbert and Wally Osterhoudt to house a 400 seat cinema, retail stores, and office spaces. Wally Osterhoudt served on the Des Moines City Council and was mayor from 1964-69. On the second floor Dr. Frank Underhill and Dr. Youker had offices. The building also housed Dee’s Mart, and the Des Moines Drugstore for awhile in the Northeast corner. I hope the new owners actually try to restore the building instead of tearing it down. It may be beyond hope but I hope they try. First run movie rights aren’t just given away so they may have a real asset on their hands. I’m picturing dinner and a movie on the site. Are you kidding. Doze this eye sore and build a 7 story multi use building with commercial/retail on the bottom and condos on the top with amazing views of the sound. Our downtown cannot tolerate the “please preserve the history” attitude. This City is going broke. I agree. I’m native to Seattle and lived in Des Moines from 1982-2006 before moving a few miles to Normandy Park. My children grew up there. DM is a jewel put you would never know it by going down Marine View Drive. Nothing but a hodge podge of buildings with no cohesive planning what so ever. How many decades will the old marine supply building be a hole in the ground and an eye sore? City Planners pull it together! I would love a quote from Mr. Spalding on what his plans are for the building. Hopefully someone actually does something with it. Bulldoze it. Ugly ugly ugly. The whole block is ugly except the AllStar bar. Yes, a bunch of drunk people standing in front of a building smoking and making it undesirable for families to walk by is certainly the best part of the block. Wanker, I was thinking the same thing. I have to drive past there on my way home from work at about 1 am and have had to dodge the fine patrons of that banner establishment! Done properly, the City of Des Moines could have a theater company in their midst ready to perform plays six times a year. I’ve never seen the back stage facilities in the theater, consequently there would be some renovation necessary as well as bringing the building up to code. But once finished in a manner similar to the Lakewood Playhouse or Issaquah’s Village Theater, Des Moines would have a jewel tight on Marine View Drive. Think for a moment. What is the average age of those living in the condos in your Marina Area? 50? And then you also have transient boaters during the summer months looking for an evening’s entertainment. You also have a “downtown” hotel right next to the facility that could run weekend promotions as well as a plethora of restaurants in the area that are crying for business after 10:00 PM (excluding all the bars, of course). Get in someone who can run the facility six weeks out of every two months (Friday, two Saturday, and a Sunday performance) and then you have the option for rehearsal space Monday through Thursday while employing people in a costume shop and set design space. All in one building. And presuming the facility can hold about 300 people, it could be rented out the other two weeks every month for conferences and School Events. And yes, you could also show first run movies, if you wish. The trick is to recreate the Art Deco ambiance the theater used to have, make it a “downtown” focal point, and partner with some of the many restaurants and hotels in the area to offer package deals. Give “downtown” Des Moines more than just additional office space. Make the old theater into a destination that people want to go to for exceptional entertainment. You have the potential for another Village Theater. Don’t let it go to waste. It could be like Taproot Theatre in Greenwood that just celebrated its 40th Anniversary. One good thing about Des Moines is that it never changes much. I hope to see that old theater there in a zillion years from now. That magical place where first kisses happened and teen age girls almost shook down all the walls with their screaming over the Beatle’s movie…and a thousand other things happened…that will never happen again. Some things aren’t meant to go away. I promise you that. That place is as sacred and holy as any cathedral in Rome.